Another wonderful addition to our already extensive line up of amazing music boxes. This hand crafted work of art will truly be appreciated by any art or music lover, friend or loved one. We are proud to offer this item here at the Attic. 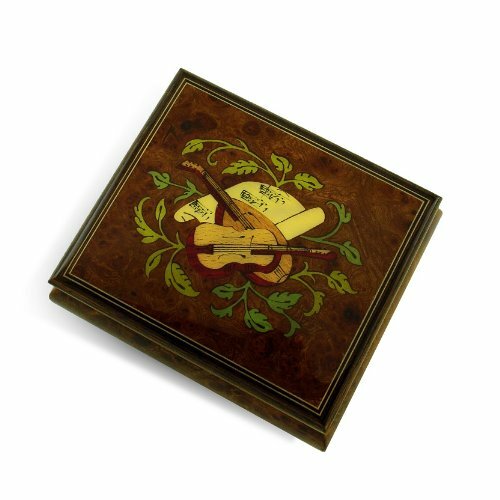 This amazingly detailed music box features a traditional layout with a floral and instrument theme(violin and mandolin against sheet music). This all sits against an exquisite natural light wood tone and framed inside a beautiful dark rosewood border. The extraordinary exterior features is complimented by its plush interior. Listen as the wonders of sound fill the room with a melody only a traditional mechanical movement can produce. It will sure bring moments of tranquility time and time again. With over 380+ tunes available, you're sure to find that perfect melody. Please see "item options" for available tunes or visit our "listening station" for all song titles as well as sample clips. Length - 4.25" Width -3.75 Depth (Height) - 2"